Maggie Cheung is Dating French-Chinese Designer? Since breaking up with millionaire beau OB Tsang (曾安邦) in 2011, 45-year-old Maggie Cheung’s (張可頤) love life remained empty. However, Maggie was spotted meeting with 37-year-old Chinese-French designer Leonard multiple times this past week. On January 2, Maggie and Leonard dined at a high-end Italian restaurant in Tsim Sha Tsui. They sat on the same side of the table and were engaged in conversation for the next two hours. Maggie was very expressive and smiled a lot. Reportedly, the two conversed in a mix of English and Cantonese. Maggie also spoke a few words in French. Leonard was very attentive – when he noticed that Maggie was cold, he helped her put on a jacket and ordered a hot drink for her. Maggie also paid the bill. Leonard, who is of mixed French and Chinese heritage, has been working as a designer in Hong Kong for a few years. They met each other through a mutual friend approximately a year and a half ago, when Maggie was visiting France for vacation. Leonard acted as Maggie’s tour guide while she was in France, and the two clicked almost immediately. They two kept in contact after Maggie returned to Hong Kong. They only started dating half a year ago. On January 3, Maggie was seen shopping for men’s clothing in Tsim Sha Tsui. She also shopped for bedsheets and other home appliances. On January 5, Maggie met with Leonard again, and they had brunch with a few other friends. 27 comments to Maggie Cheung is Dating French-Chinese Designer? i watched up to Episode 15 of To be or not to be. it is pretty good. Interestingly enough, I also never really liked Maggie until her performance in To Be or Not To Be. 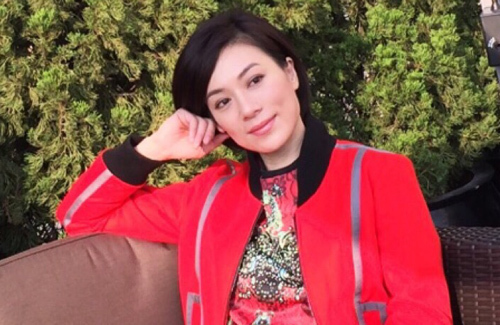 Don’t get me wrong – she was a solid actress even in her TVB days, but I just never really enjoyed watching her performance on screen for some reason (not sure if it was the characters she played, chemistry with co-stars, or what….) But with this series, I’m thoroughly enjoying Maggie’s performance…and Prudence too – both of them have been fantastic throughout the entire series — especially so in the recent 2 emotionally-charged episodes (eps 21 and 22). By the way, the series itself is EXCELLENT – the script is very well-written, the acting is great (with the exception of 2 or 3 people), the pace is good, the scenery is amazing…highly recommend this series! women over 40s should lower their standard and not be too demanding in finding partner for companionship . Most men if not all just want to have fun and enjoy at the moment with older women, there is no love just lust. Once the lust gets worn out, most guys will move on to the next target. Sounds interesting. First it was Hsuin Huin, then Ella and now Maggie who has fallen in love with foreigners. There must be many of them in HK. Maggie looks just as lovely and young as when I first took notice of her in some series many years ago. I like her and her acting. Foreigners don’t have this age stigma that Asian men do. I think it’s really despicable the way Asian culture is, but that’s how it’s gonna be until they run out of women. I guess that’s why Westerners are such huge consumers of pedophilia & child prostitution in S.E. Asian countries. Puhlease. Pedophilia runs in every country. There’ll always be disgusting felons and creepy old men who want things they can’t have. But at least it’s banned and openly discriminated in the U.S. Places where this is acceptable, like most Asian countries, is where the problem lies. She’s way past her prime and quite homely to begin with. He should latch on to Leonard before it’s too late!! i thought she liked women? oh Happy for her! Hope she find love and happiness! She grew up in England. She’s pretty independent. Fluent in English. I’m just surprised she dated Chinese men at all. At least she gave them a shots, dated mostly Chinese men in the past (that I know of). So if now she’s dating a kwai lo (or half), it’s cool. More power to her. It doesn’t matter if he’s young or old. Hmm your post kinda implies growing up in the West leads you to like White ppl. I think the odds of liking White ppl are higher cause you grew up with their influence but it’s not automatic. I know a lot of Asian women here who prefers Asian men instead. I meant to say she grew up in a boarding school there and she talked about her personality being very frank and westernised, these qualities are not ideal in most traditional Asian men (in Asia! no less) when looking for a partner. Growing up in the west does not necessarily mean one would be or should be “white-worshipping”. With appropriate upbringing & a healthy regard for self-esteem, most Asians growing up in the West may have Western friends but won’t automatically be beholden to them. Quite the contrary, they’ll see institutionalized racism against minorities & the bamboob ceiling. Unfortunately, most migrant Asian parents drop the ball on the upbringing part & expect their kids to embrace all things white. I’d really actually liked her when i was watching her dramas but I guest due to her diva attitude TVB doesnt want to handle it anymore and booted her SMh…..
Good for her! Age should not matter in a relationship … as long as they are happy together and could get along well with each other. Happy 4 u, Maggie. Watch ur back though. Time will tell whether he’s a giver or a taker. I suppose an eight year gap is reasonable. They say younger men r into older women bc older women are not only more mature, and financially independent, but they’re also better lovers and usually won’t mess with your head. Again, time will tell.